With a high-profile remake on the way, it’s time to put this crowd-pleasing hit from 1976 back in the spotlight. I have every reason to want to love this movie. The 1976 version of A Star Is Born is actually the third time this story has been made, following a 1937 film starring Janet Gaynor and Fredric March, and another in 1954 starring Judy Garland and James Mason. The central premise behind all of them is that a fresh-faced Hollywood newcomer finds success in the spotlight under the mentorship of an established star who is in an alcoholic decline. What the 1976 version brings to the table is a fresh new setting, replacing the glitz and glamour of old Hollywood with the excess of the music industry in the seventies. I’m a massive fan of the music scene from this time period, and I’m also wild about Kris Kristofferson, who made an appearance earlier in this series when I wrote about another of his 1976 films, Vigilante Force. While the two movies couldn’t be farther apart thematically or in what they’re trying to do, Kristofferson is remarkably the same in both. I’m even a fan of Barbra Streisand, especially her younger years, when she hadn’t yet become an icon and was still an ascending talent. That’s why I’m a little disappointed with this incarnation of A Star Is Born. The movie has a lot going for it, but it doesn’t seem to know what to do with any of it. This is probably due, in large part, to production difficulties behind the scenes and a clash of too many egos. The film was co-written and directed in large part by Frank Pierson, the man behind the Academy-Award-winning screenplay for Dog Day Afternoon in 1975. Just before A Star Is Born hit theaters in December of 1976, he released a written piece called “My Battles with Barbra and Jon” detailing the infighting and struggle for creative control behind the scenes between himself, Kris Kristofferson, Streisand, and Streisand’s boyfriend at the time, Jon Peters, a hair stylist to the stars who went on to have quite the controversial career. This isn’t a smear piece on the people behind this film, but if you’ve ever heard Kevin Smith tell that story about meeting an executive who wanted to put a giant spider in a Superman movie, he’s talking about Jon Peters. The producer is also one of the subjects of the book Hit and Run, which details Peters’ ascension from salon owner to movie executive. All this goes to say that the production of A Star Is Born was mired in huge egos, with everyone involved trying to use it as a vanity project. There are many questionable decisions that I just can’t wrap my head around. Kris Kristofferson was a musical sensation in real life during these years, bringing his gravely warble to a musical style that had one foot in outlaw country and another foot in rock and roll. His strength was in authenticity, and his songs were rooted in acoustic folk, with tunes about solitude, being on the outside, and never quite being able to overcome his own demons. So why, then, does the movie choose to cast him not as a troubled troubadour, but as the lead singer of a big rock and roll band called Speedway? There has always been a rock and roll edge to Kristofferson, but he’s a singer/songwriter, not the front man of a rock band. It’s a bridge too far, and it feels forced. There’s an argument to be made that this casting was entirely intentional and we’re supposed to realize that Kristofferson doesn’t belong in this band, but then how do we explain the sold out arenas and festivals for this group? By all accounts, Streisand (who really seems to have been running the show here) wanted Elvis to star in as the male lead in this film, even going so far as to approach him at one of his Vegas concerts. Elvis was interested, but his manager Colonel Tom Parker was ultimately against it, so it never happened. I have to say, though, that Elvis would not have been a good fit as the lead singer of a rock band. Like Kristofferson, Elvis was a singular personality. There are even reports that Mick Jagger was considered, but that didn’t pan out either. All of these potential choices seem wrong to me. This movie doesn’t need a rock and roll band, it needs a single tortured soul. When Kristofferson isn’t on stage, his unique brand of self-destructive charm works like gangbusters because it resonates as true. Kristofferson freely admits that he was drunk for pretty much the entire shoot, and was so unhealthy that his doctor convinced him to quit drinking soon after this movie in order to stay alive. But any time Kristofferson is on stage backed by an entire band, it doesn’t work. KK is not that guy. He’s a loner, and the part should have been for a singer-songwriter. Equally, it’s kind of hard to buy Barbra Streisand as a struggling musician who spends her nights playing clubs. 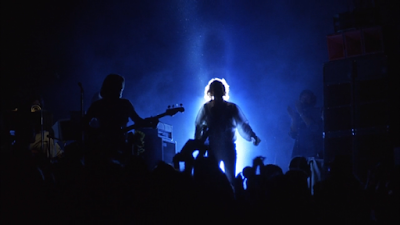 The movie does her no favors by placing her in the rock concert environment, which feels forced and isn’t a great fit for what she does. Furthermore, it becomes very clear early on that this is Barbra Streisand’s movie, which robs the character of a real arc. We already know how this is going to go because we know who she is. It never feels like she’s struggling. It never feels like she’s eager and hungry and desperate. Some have suggested that Kristofferson was miscast, but I think it might have been Streisand who seems the most out of place in this world of festival rock concerts and hard living. The script doesn’t help things, either. Sometimes it feels so unrealistic that it comes off like comedy, and other times it’s completely humorless and tone-deaf. I’m not sure how it’s possible for a movie to seem 45 minutes too long and completely rushed at the same time, but this one pulls it off. The entire first third of the movie is decompressed in a way that is not good, with concert segments going on way too long. Kristofferson’s band, Speedway, plays multiple songs before we’re even given the inkling of a plot, giving us zero reason to invest. Then we are introduced to Streisand, who is clearly very talented and charismatic, but has no chemistry whatsoever with Kristofferson and doesn’t really fit into the rock and roll world that this movie is trying to establish. There’s a romance that feels forced instead of true, and we’re treated to too many ham-fisted vignettes that depict how troubled Kristofferson’s character is. Again, some might suggest this is all done deliberately to paint her as a fish out of water who must overcome jaded audiences with her raw talent, but that’s not my take. Ultimately, it feels like a movie that is torn in too many different directions because I think that’s exactly what it was. It feels like a vanity project for everyone involved, but it’s Streisand who seems to have been the one that stands victorious. This is not a plot spoiler: the film ends with Streisand giving an emotional musical performance shot entirely in close-up with no cuts or edits. It’s literally a single camera shot zoomed into her face for the duration of the song. Then she strikes a sacrificial pose, the film freezes, and the credits run over this same shot. It’s seriously like ten minutes of her face in close up. It feels overly-grandiose. It feels self-important. It feels like the movie is trying to pay off drama that it never quite earned. We started this film at a rock concert, but we end with a ballad. I don’t understand. 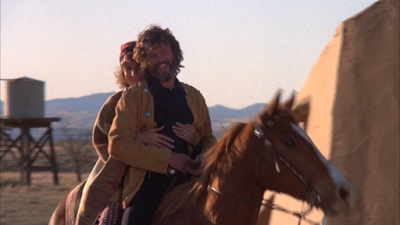 Of course, none of this really matters in the long run because the movie was very successful at the box office; people seemed to know that the real draw here is seeing Kris Kristofferson being effortlessly cool and Barbra Streisand simply being Babs. So what if it’s too long and feels melodramatic in a way that hasn’t aged well? Audiences didn’t care, and turned up in big numbers, making this the third most successful film of 1976. 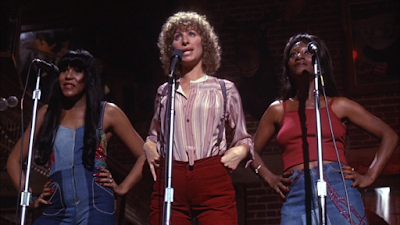 This is also the movie that launched a million perms thanks to Streisand’s tight curls. On that note of appreciation, there are things to celebrate. Gary Busey plays a supporting role and brings that crazy intensity that he’s known for. He’d finally get the spotlight a couple of years later with 1978’s The Buddy Holly Story. Robert Englund, Freddy Krueger himself, appears in a memorable scene early in the film. Even the Oscar-winning song from this movie, “Evergreen,” has some prestige because it was a collaboration between Streisand and Paul Williams. A Star Is Born is not a bad movie, it’s just a mixed bag. Some of the elements work really well, but an equal number of them don’t, making for a frustrating experience. Trimming 30 minutes from the running time, tweaking the story a bit, and allowing the actors to play to their strengths instead of forcing them into roles that don’t fit would have gone a long way to making this a better film. I believe Streisand has pointed out herself that the concept of A Star Is Born is one that lends itself to frequent re-interpretation. Every couple of decades, this story can be retold for contemporary audiences, just like it was in the thirties, the fifties, and the seventies. But I also can’t help but notice that it’s been over forty years between the last time this story was told and the latest version with Bradley Cooper and Lady Gaga. I wonder if it’s because the 1976 interpretation is so iconic, or if it’s for another reason entirely. I remember I saw this twice in 1976. The second time was at a second-run theater that added its own intermission in order to sell more snacks! I like the way that second-run theater thinks. A snack is born! i'm really curious about the remake, Lady Gaga looks like a good actress in the trailer. I caught an early screening of it in November & as much as I wanted to love it, it just didn't gel. Something felt off. I've no idea how much will be changed in the editing room so don't let me put you off. Lady Gaga pulls it off & I was really impressed with Bradley Cooper's singing & direction. It just felt a little uneven. Everything you said i expected. Lady Gaga good in the role. Uneven movie. Go see it, if for anything the performances are great on the big screen.